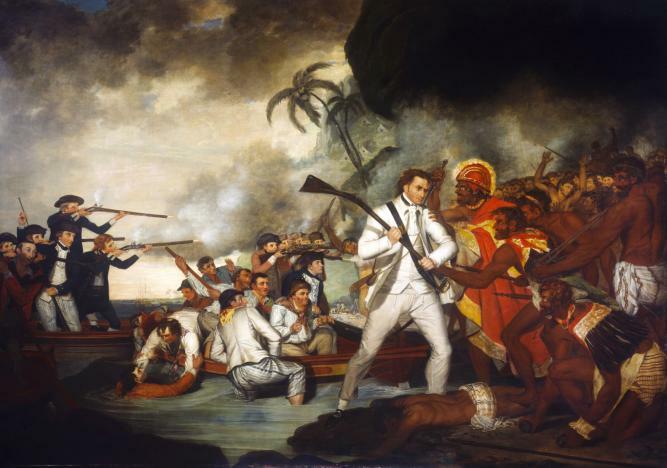 The Death of Captain James Cook, F.R.S. 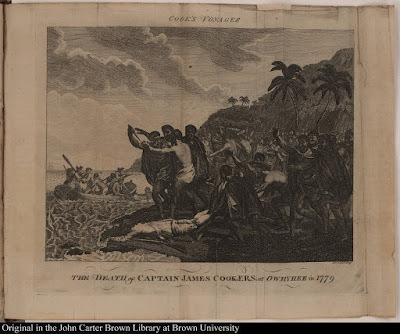 at Owhyhee in 1779, Daniel Lizars, 1790, John Carter Brown Library Archive of Early American Images. This engraving was included in the 1790 book Captain Cook's Voyages Round the World, and is yet another in the long line of artistic representations of the event. In this version, Cook's killer is portrayed as Brutus, complete with dagger and toga. Cook himself is shown in a less than heroic pose, already slain and being dragged away by a Hawaiian who wears his pilfered coat. Just as the engraver took inspiration from classical representations of the death of Caesar, the sailors and officers clambering into the boat are clearly drawn from George Carter's 1783 painting The Death of Captain Cook. Sailors, marines, and naval officers are mixed on the boat, but we can pick out a few figures who are definitely sailors. They wear plain trousers and close cut hair, with jackets sporting scalloped mariners cuffs. One oarsman has his back to us, showing his jacket to be triple vented.